Astrid Amalia: Come On! Come On! Come On! Indonesia Can! 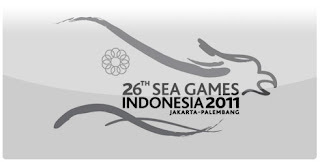 Indonesia is very proud to be the host of the 26th Sea Games which will take place from June 11 to 22 November 2011 in Jakarta and Palembang. Of course, we are proud of this international sport event. One small thing that became my question is whether the Sea Games event can bring up the sense of nationalism just like when the Indonesian team competed in the World Cup. Yes, you can, Indonesia! And I also hope that the Sea Games event can unite the Indonesian nation again through sports. Small fact that I've found is that Indonesia has previously hosted the Sea Games for three times and has won numerous medals. The last time Indonesia won a gold medal was in 1997, and after that, we did not win anything else. In 2011, it's time we reclaim glory in those golden periods for the sake of our beloved country! It is time for our own people to support our athletes. The athletes have a dream to win every game they do. The support for their dreams is also a support for our beloved country. There are a lot of controversies and issues about the Sea Games this time, starting from its preparation, political debates and other matters around the Sea Games event. We should disregard this. Do not let this interfere the Sea Games event and reduce our support to our sport in our own country. We should be confident that we can achieve our dream to become the champion at the 26th Sea Games event and beyond. One support for the 26th Sea Games event is a website called: http://ayoindonesiabisa.com. On this website, the Indonesian people can show its support for Indonesian athletes to win the game. The musicians, Sherina and Ello, sang the theme for the current Sea Games event that can be viewed at: http://www.youtube.com/watch?v=X9-JNEinFRo. The official website to the 26th Sea Games event is at: http://www.seag2011.com/en/. Let’s support the 26th Sea Games event! Let’s support our Red and White’s Team to win many medals! Let’s awaken our sense of nationalism through the Sea Games event! If Indonesia could win in the past, why can’t we win today? Come on, Indonesia Can!